FC Cincinnati‘s move to MLS in 2019 will coincide with a slight rebrand, as the team will officially adopt the Fussball Club Cincinnati identity. As was announced Tuesday, FC Cincinnati’s expansion bid has been formally approved by MLS. The club will begin MLS competition in 2019, with matches to be played at its current home–Nippert Stadium. 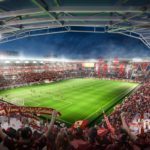 It is currently expected that the club will move into a new stadium on the city’s West End in 2021, so Nippert Stadium will serve as the home venue until that facility is completed. With FC Cincinnati in the fold, MLS is expected to play at 24 clubs next season. The league is fielding 23 teams during the 2018 season, a slate that includes expansion Los Angeles FC, which officially began play this year.